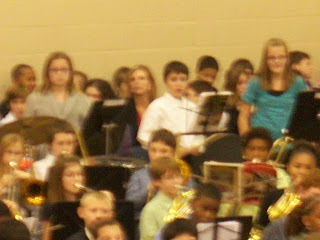 Last week was Andrew's First Ever Band Concert--and official first Jazz Band Performance. It was so crowded at the school. The principal announced for the spring concert, they would split it and do two nights to help keep the crowds down. We were in the bleachers not quite halfway up, but it's still a LONG way away for my super zoom. First is Andrew with the band. Here's Andrew with the Jazz Band. Here are a few videos of the performances. The first song Andrew is playing the snare drum. He's standing in the back almost center with the white shirt on. For the second song, he's playing the bell kit (looks like a big xylophone). Still in the back standing, white shirt. They are playing "Jing-a-Ling Bells". 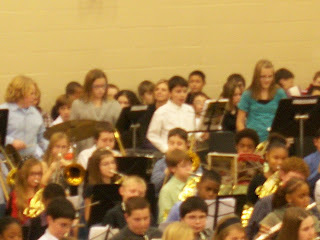 For his Jazz Band performance, they played "You're a Mean One, Mr. Grinch". There are three pianists and only two pianos. So for this song, Andrew played the left hand and his partner played the right hand. The other pianist was filling in on the drums for the drummer who broke his arm. 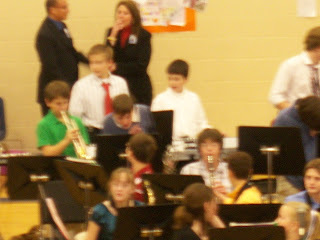 It's hard to see Andrew because one of the trumpet players was in front of him. It was so crowded, I couldn't move any to get a better view. If you see the two adults (administrators) standing in the back, Andrew is the 1/2 person you see behind the trumpet player in blue. 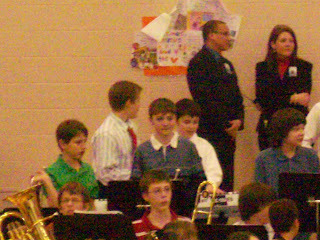 He's standing to the right of the boy in the white shirt with the red tie. Hope you enjoy our concert tour of kids programs. I'll put Nathan's school program up this week, too.